The past century has witnessed profound transitions in Brazil’s economy: from a surge of industrialization connected to export economy, to state projects of importsubstitution industrialization, followed by a process of neoliberal global market integration. How have Brazilian entrepreneurs and businesses navigated these contexts? This comprehensive text explores the institutional and sectoral structure of the Brazilian economy through a collection of new case studies, examining how key institutions work within Brazil’s specific economic, political and cultural context. Offering a long-term evolutionary perspective, the book explores Brazil’s economic past in order to offer insights on its present and future trajectory. The contributions gathered here offer fresh insights into representative sectors of Brazil’s economy, from aerospace to software, television, music and banking, paying particular attention to sectors that are likely to drive future growth. Chapters include questions about the roles of foreign and state capital, changes in market regulation, the emergence of new technologies, the opening of markets, institutional and organizational frameworks, and changing management paradigms. When examined together, the contributions shed light not only on Brazilian business history, but also on the country as a whole. 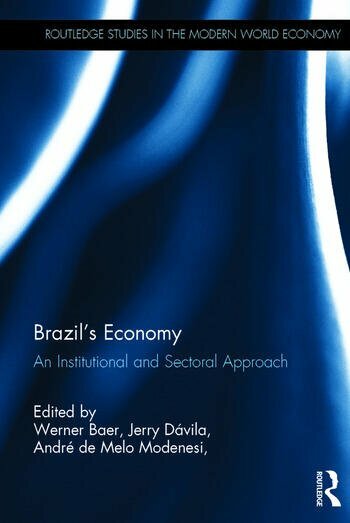 Brazil’s Economy: An Institutional and Sectoral Approach offers fascinating reading for anyone with an interest in: Latin American Economics; the business history of the region; and in doing business in present-day Latin America. Jerry Dávila is Jorge Paulo Lemann Professor of Brazilian History and Director of the Lemann Institute for Brazilian Studies at the University of Illinois at Urbana-Champaign, USA. André de Melo Modenesi is Associate Professor at the Instituto de Economia at Universidade Federal do Rio de Janeiro, Brazil. Maria da Graça Derengowski Fonseca is Associate Professor at the Instituto de Economia, Universidade Federal do Rio de Janeiro, Brazil. Jaques Kerstenetzky is Associate Professor at the Instituto de Economia, Universidade Federal do Rio de Janeiro, Brazil. Werner Baer was Jorge Paulo Lemann Professor of Economics at the University of Illinois at Urbana-Champaign, USA.